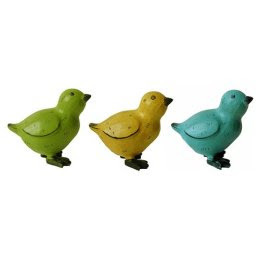 Just bought three of these little chicks in the Smith & Hawken section at Target. So cute. I bought them all in yellow, in three different poses (not shown on the website), to represent my three little chickees. Aww, sweet... We'll put them on the mantel for Easter... probably with some wooden eggs and such. yeah, i've always liked the ducks, too. i used to look at the bigger ones at the Smith & Hawken store all the time. i was never sure what i would do with them though. the chicks were just too perfect for Easter and the fact that there were three poses... too perfect for the three kids. Any chance you still have your chicks and want to get rid of them? I have 8 to represent my kids and just had a ninth and have no more chicks!